This article is about a town in New Brunswick. For other cities, see Grand Falls (disambiguation). Grand Falls (French: Grand-Sault) is a town located in Victoria County, New Brunswick, Canada. Grand Falls is situated on the Saint John River. The town derives its name from a waterfall created by a series of rock ledges over which the river drops 23 metres (75 ft). Its population was 5,326 at the 2016 census. In 1686, Monsignor de Saint-Vallier (of Quebec) was the first known person to mention in writing the magnificent falls for which Grand Falls is named. His words describing the area can be found on a monument erected at the mouth of Davis Park in 1986. He recounts his trip to the region in 1686. He writes: "On May 16 we arrived at a place called Grand Sault St-Jean-Baptiste. Here the river falls madly from a height of 60 feet, forming a huge waterfall that thick fog envelops the tumult of the falls far warns mariners descended in canoes. It also notes the presence of some French settlers in the region. In 1695, the territory between Grand Falls and Médoctec was granted the manor in Sieur Rene D'Amours. The French missionaries, Récollets, visited Great Falls in 1691 and Antoine de Lamothe Cadillac mentioned the presence of a fort in 1693. The latter was used to supply the passengers, who became more numerous from the Seven Years' War. In 1791, Thomas Carleton, then Governor of New Brunswick, built a fort at Grand Falls. The Madawaska region was then disputed between Quebec, New Brunswick and the United States. The War of 1812 showed that the area's roads were not safe and in 1875, the colonial government of New Brunswick decided to build a road from Woodstock to Grand Falls. In 1816, the government gave a grant to two settlers to settle between Grand Falls and Presque Isle. The territorial differences culminated in the Aroostook War in 1838 and Webster–Ashburton Treaty in 1842, gave Grand Falls to the province of New Brunswick. In 1838, James Brown and George Hayward visited Grand Falls and mentioned the presence of a sawmill owned by John Caldwell staffed by French Canadians and Acadians. In 1840, Lieutenant Cavalié Mercer, an Englishman stationed in Woodstock, made the first paintings of the city. In 1842, Grand Falls was included in Colebrook Township, named in honour of the Governor of New Brunswick, William MacBean George Colebrooke. The first survey was done for the British army in 1844 by the Deputy Gordon, while Colonel Beckwith designed the town plan. The survey was made from a large elm to the west, which has now disappeared. The lots were in turn divided into 1847 by the engineer C. Inches. Grand Falls is located in the valley of the Saint John River, south of Madawaska, 55 kilometres southeast of Edmundston, on the Canada–United States border. Grand Falls is located at the north-west of Victoria County . 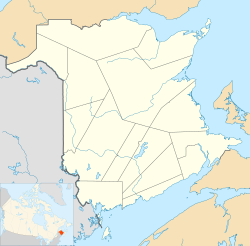 The eastern part of the town, located on the left bank of the river is actually in the county of Madawaska, not to be confused with the eponymous region. Aroostook County, Maine is located to the west. Grand Falls is adjacent to St. André to the north, and the parish of Drummond to the east. Grand Falls has a humid continental climate (Köppen Dfb) with vast seasonal differences and being cold for the latitude. Three main industries reside in Grand Falls: potato farming, potato processing (The McCain frozen food plant) and tourism. The town is also a local commercial centre for Victoria County, catering to the surrounding communities of Plaster Rock, Perth Andover, Blue Bell, and New Denmark. Among the main retailers of Grand Falls as of January 2014 are Sears, Walmart, Canadian Tire, Home Hardware, Dollarama, Giant Tiger, Atlantic Superstore, Kent Building Supplies Shoppers Drug Mart, Jean Coutu and more. Among the main activities located in Grand Falls, one can visit the Grand Falls Golf Course, the Grand Falls Marina, the Museum, the Farmer’s Market (summer), numerous camp grounds, Grand Falls Airport (www.grandfallsaviation.com), and the Grand Cinema 3. The town of Grand Falls has also acquired a new arena, the E & P Sénéchal Centre. The multi-purpose 1200+ heated seat arena opened in late August 2009. The town also has a cross-country ski club, Kahoutek Ski Club, with many kilometers of groomed trails adjacent to the Golf Club and the E.P. Senechal Centre. There are many outdoor activities you can do in Grand Falls such zip lining by the gorge and waterfalls, kayaking, canoeing, boating in Saint John river or enjoying a pontoon ride to view the spectacular Grand Falls Gorge in the summer. Most tourist-centric locations are only opened during the tourist season. Every year the town celebrates its Regional Potato Festival. This event coincides with the end of June and beginning of July, during the Canada Day weekend. It includes a carnival, a Broadway block party, a bistro with live entertainment, the Miss Grand Falls Gala, fireworks and several other events. The Grand Falls Public Library began as a small group of readers forming the Literary Club founded by Senator Muriel McQueen Fergusson. Members campaigned in 1948 to establish a formal library and the Grand Falls Public Library officially opened its doors for the first time on April 20 1949. The library was housed in a small building located on Broadway Boulevard where now stands the Dari Delite and was once the old Post Office. In 1950, it then relocated further down the boulevard to the Anita Lagace building, which currently houses LP Godbout Insurance. In June 1972, the library moved a third time to the New Brunswick Electric Power Commission building. It also became incorporated into the Haut-Saint-Jean Library Region in the very same year. In August 1983, the library moved from Broadway Boulevard to the Masonic Hall on the corner of Sheriff and Church Street. Since January 1999, the Grand Falls Public Library has been located on Pleasant Street in the municipal building and it is still part of the Haut-Saint-Jean Library Region, one of the five regions of New Brunswick Public Library Service. John Caldwell School's first building, a two story structure, was built on the site of the John Caldwell School in 1909. In 1951, a brick building was built on the same lot. It housed the industrial shops, gymnasium and home economics facilities. It was named the Grand Falls Composite High School. A wing was built in 1966, and in 1969 the name was changed to the John Caldwell School. In 1982, the original wooden building was demolished leaving only the new structure. In 1971, the school became a Junior High School and in 1981 it became the Junior-Senior High School for the anglophone students of the area with Richard Michaud serving as principal from 1966 to 1991. Major expansion began in 1989 to include the English elementary students making it a K-12 facility. Kevin Harding is the current principal. Grand Falls is serviced by the French daily L'Acadie Nouvelle of Caraquet and the English-language daily Telegraph-Journal of Saint John . The weekly bilingual La Cataracte/Victoria Star is published in the town. The French bi-weekly publication Journal Le NordOuest is available on-line and distributed to more than 5000 members. The French weekly L'Étoile of Dieppe is also distributed, and Tri-Weekly Bugle-Observer and the weekly Carleton Free Press, both published in Woodstock . ^ "Grande Falls Drummond, New Brunswick". Canadian Climate Normals 1981–2010. Environment Canada. Retrieved 30 March 2015. ^ Statistics Canada. "Grand Falls, TV [Census subdivision], New Brunswick and New Brunswick [Province] (table)". Census Profile. 2001 Census. Statistics Canada Catalogue no. 95F0450XCB2001001. Ottawa. Retrieved 9 January 2019. ^ Statistics Canada. "Grand Falls, TV [Census subdivision], New Brunswick and New Brunswick [Province] (table)". Census Profile. 2016 Census. Statistics Canada Catalogue no. 98-316-X2016001. Ottawa. Retrieved 9 January 2019. ^ "NB Power System Map". NB Power. 2005. Retrieved June 29, 2006. Wikimedia Commons has media related to Grand-Sault.